Scientific and Research Poster Printing on Fabric, Paper, or Vinyl! 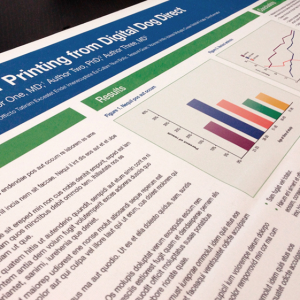 Digital Dog Direct is the place to go for scientific poster printing. There’s no project too difficult for our large-format printers. Our printing experts can match color and make sure your research and medical posters stand out whether they are printed on paper, vinyl, or fabric. You can expect fast turnaround because Digital Dog Direct uses water-based latex ink that dries immediately and leaves no odor. Perfect for printing scientific posters on fabric that can easily fit into your suitcase, briefcase, or any other type of carry-on. We ship almost anywhere in the world and can make sure your scientific poster arrives at your conference or hotel at the same time you do! We are able to laminate on one or both sides of a poster — with widths of up to sixty-one inches! We can also mount posters on a backing that can be up to one and one-half inches thick. Need Design and Layout Services, Too? We have a design partner with decades of experience with scientific posters who can turn your poster project into the distinguished visual presentation your hard work deserves. Their scientific poster clients return year after year and include some of the most familiar names in the pharmaceutical and medical communications industries. Need a printing quote for your next poster? Contact us today! 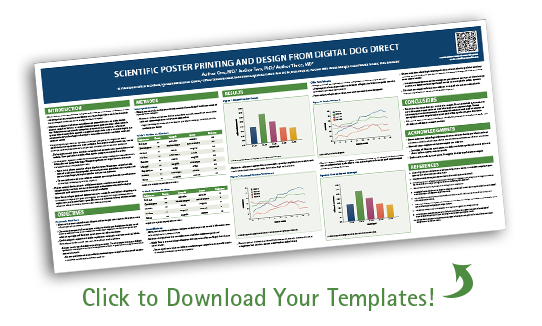 Download our free scientific, medical, & research poster templates for InDesign and PowerPoint!